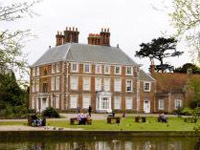 Enfield Council’s proposed renovation plan for Forty Hall in Enfield has been given the go-ahead by the council planners. However, the plan seems to verge on invasive and to contravene best practice guidelines from organisations such as the Society for the Protection of Ancient Buildings which recommend preserving as much historic material as possible to show how a building has developed. The changes are part of plan funded with nearly £2m in grants from the Heritage Lottery Fund. The Grade-I listed house was originally built in 1629 for Sir Nicholas Rainton, a City Alderman, President of St Bartholomew’s Hospital and Lord Mayor of London. The house passed through various owners until bought in 1895 by Major Henry Bowles who made many changes including a new staircase with stained glass incorporating his family’s coat of arms. replacement of the main staircase. It’s the latter that seems to be the most worrying change as the staircase was an important part of the history of the house. The Victorian Society has raised their objection to this loss. Interestingly, the press release inspired news story doesn’t mention whether English Heritage or the Society for the Protection of Ancient Buildings have given their approval. Also of concern is the intention to redocorate the interior which will be carried out “by detailed investigation of historic finishes” – which doesn’t say that they will follow the evidence of the past. All in all this seems to be a council who have approved their own plans to make many insensitive and substantial changes to a Grade-I listed building in an attempt to create a ‘theme-park’ pastiche of an old house. Perhaps a more considered approach would not only preserve more of the historic fabric the council seem so willing to rip out but would also offer cost savings. The plans still require approval from the Secretary of State, John Denham, before they can be implemented so there is hope yet that this apparently inappropriate scheme might yet be modified so that whilst still meeting the council’s aim of increasing access and improving facilites it’s much more sensitive to this elegant house. This entry was posted in At Risk, News and tagged At Risk, buildings at risk, country house, enfield, english heritage, forty hall, grade-i, heritage, listed, middlesex, restoration, SPAB. Bookmark the permalink.